Development can impact a watershed in many ways. For instance, the change in land use from a forested area to a suburb can result in an increase in pollutants that are deposited on surfaces, such as particulates from automobile tailpipes, nutrient-rich fertilizer residues that remain on lawns and improperly discarded pet waste. In a developed watershed, all of these pollutants are picked up by rainwater and ultimately washed into our rivers and streams. Development not only removes beneficial vegetation, but it tends to replace it with hard surfaces, like roofs, roads and parking lots. This minimizes the areas where water can infiltrate into the soil; this is important because the water that infiltrates into the soil is the same water that replenishes aquifers and provides base flow for many streams. Another result of all this "hardscaping" is the dramatic increase in the volume of runoff. This volume increase can lead to flooding and overburdened water infrastructure systems. In areas of the State where the storm sewer system is combined with the sanitary sewer system, this increased volume can lead to discharges of untreated sewage into our waterways. Traditional, or gray infrastructure, generally focuses on collecting rainwater and sending it downstream to ultimately be discharged into a waterway. Green infrastructure (GI), on the other hand, mimics natural processes utilizing soils and vegetation to manage rainwater where it falls. GI can be applied on different scales. For instance, on a regional scale, GI can focus on an interconnected network of waterways, wetlands and forested areas. In this way, municipalities can incorporate stormwater management goals into their open space plans and greenways plan. 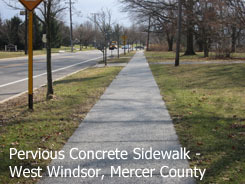 Information on the Garden State Greenways program is available at http://www.gardenstategreenways.org/. Municipalities can also incorporate GI on a neighborhood scale. Tree plantings and downspout disconnection can be utilized in areas where there is an existing flooding problem. GI can also be used in downtown areas, green street planning can help promote walkability while at the same time managing stormwater. Schools and community groups can also incorporate GI strategies such tree planting and community gardens the neighborhood scale. These practices can go a long way to creating a neighborhood. GI can also be applied on a site-specific scale. Business owners can retrofit parking lots with pervious pavement and larger bioretention systems that can be placed in the islands. Some businesses may be able to collect rainwater in a cistern for non-potable uses. Many school campuses are large enough to incorporate rain gardens and tree plantings, as well as installing pervious pavement on parking lots and basketball/tennis courts. Homeowners can also incorporate GI into their existing landscape. GI strategies, like rain gardens and rain barrels, are easily implemented into yards. Chapter 2 of the BMP Manual - Low Impact Development Techniques. Green infrastructure practices to be incorporated into site design should be selected based on an evaluation of individual site characteristics and needs. Informational fact sheets on common GI practices, including rain gardens/bioretention basins, grass swales, constructed gravel wetlands, and rain barrels, can be found on the left hand side of this page. GI practices are generally considered as part of development design, but most GI practices can also be used as a retrofit option once a site has already been developed depending on the site conditions. Finally, despite the name, "green" infrastructure doesn't have to be vegetated; GI can include designs incorporating pervious pavement and sand filters that use the soils to reduce runoff and treat pollutants, and rain barrels and cisterns that store rainwater for later reuse. GI manages stormwater in two ways: by reducing the volume of runoff and by treating runoff. GI strategies reduce runoff volume by allowing rainfall to infiltrate into the soil where it can be used by plants or where it can recharge aquifers and stream baseflow. Another way to reduce volume is to capture the rainfall in man-made structures like rain barrels or cisterns where it is stored until it can be reused; however, the use of this stored water is limited to non-potable uses, such as irrigation.